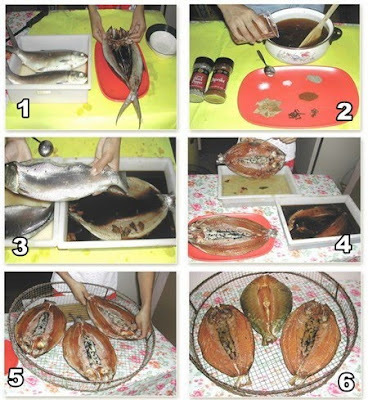 Wash milkfish then split. Remove all internal organs and false kidney. Debone. Simmer the marinating solution for one hour then cool. Bring the volume to one liter. Soak the fish in the cool marinating solution for 30 minutes to one hour depending on size. Store in a chill room overnight for slow curing or at room temperature until flesh is translucent. Remove from the solution and wash surface to remove excess salt. Do not soak. Spread on trays and surfs. In the meantime, kindle smoke house. Cool before packing in boxes. Keep refrigerated if packed in plastic bags.